One of the most sought after collectable antiques is jewellery, and there is a wide variety of different types that people like to collect. Just as with fashion, trends change with time and tend to go in full circle. Your art deco diamond engagement rings could potentially be worth a lot of money, so it is advisable to take good care of them. Over time jewellery tends to lose its sheen and requires a good cleaning to bring back that sparkle. Jewellery that is regularly worn, as well as jewellery that you store securely can both tarnish over time. You can use the professional services of a jeweller to have your items cleaned, or you can also do this yourself. 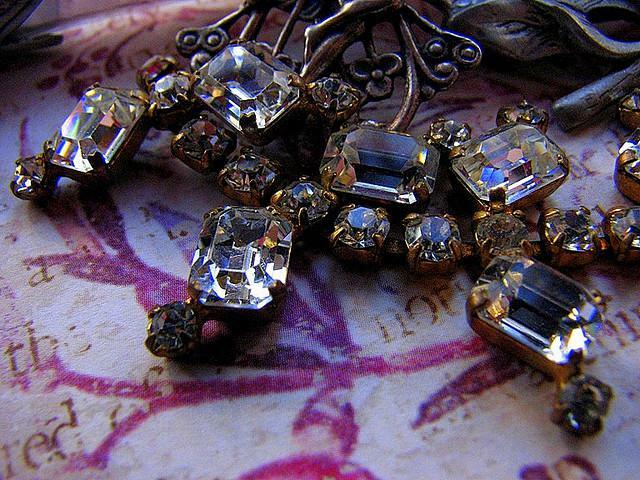 Some antique jewellery may also be a heirloom, so it can also have great sentimental value, and you would feel more secure in having a professional clean this for you. You may also not have the time or think you do not have the capability to do this for yourself. There are many competent jewellers on the high street who also offer cleaning as a service for their customers. A jeweller will not only be able to clean and polish your jewellery, but they will also be able to carry out any minor repairs. Minor repairs can include resetting the stones, or adjusting the clasps that hold the stones in place. If you have art deco diamond engagement rings, there is nothing worse than a diamond falling out of them, so making sure the clasps are all good is important in maintaining your antique jewellery. This service is one that most jewellers offer fairly cheaply and it also usually has a quick turnaround time, so you will not have to wait too long to get your jewellery back. It is quite easy to clean your antique jewellery at home, although you may need to take a few precautions. If you are cleaning jewellery that contains set stones, then you will need to use a brush rather than a cloth. When using a cloth you can find that the material snags on the clasps holding the stones in place, which could cause the stones to become loose. For this reason, you should also only clean your jewellery in a bowl, and not over the sink as you would not want to see your diamonds drop down the plug hole! For diamonds and other gemstones, soak the items in warm soapy water for a short amount of time, then brush with a soft toothbrush or even an artist’s brush. The brush will help to remove all of the dirt and grease. Some stones are softer than others, and you will need to be careful when cleaning them. During the cleaning process if you do find any stones that are loose, take your jewellery to your local shop and have them repair it. When you are cleaning these types of softer stones, make sure that you are careful and use a very soft brush. Too much pressure could result in scratches and tarnishing of the stone. When you have finished cleaning your jewellery, you should let it air dry. When your jewellery is not being worn, it should always be stored inside a separate compartment in a jewellery box. Storing multiple items together in one compartment can lead to damaging the stones or metals in the jewellery. Do keep in mind though that you are meant to wear and look at jewellery, so do not lock it away for too long before taking it out to show off!